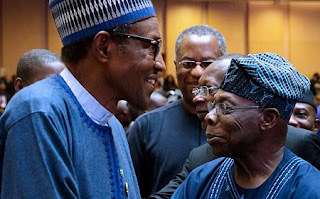 Few days after giving a damning verdict on the Muhammadu Buhari administration in a “special statement”, former President Olusegun Obasanjo yesterday met with President Buhari in Addis Ababa, the Ethiopian capital. It was at the African Union (AU) headquarters shortly before the 30th Ordinary Session of the Assembly of Heads of State and Government of the African Union. Obasanjo, a wry smile on his firm lips and his face betraying some warmth, grips Buhari by the hand. He is sprightly and stylish in a blue embroidered agbada and a blue cap with white stripes. Buhari is smiling broadly, his mood apparently no expression of any animosity against Obasanjo over his controversial “open statement”. There were no discussions; just an exchange of pleasantries and cracking of jokes as the two leaders were joined by former Head of State Gen. Abdulsalami Abubakar, according to their aides at the scene. Gen. Abubakar handed over power to Obasanjo in 1999. Obasanjo accused the Buhari’s administration of nepotism and failure to revive the economy, among others. He “advised” the president not to seek reelection. Besides, Obasanjo wrote off both All Progressives Congress (APC) and the Peoples Democratic Party (PDP) and offered to be in the vanguard of a movement to save Nigeria. The Presidency however said the former President might have been too busy to notice the government’s achievements, which it itemized, in a response by Minister of Information, Culture and National Orientation, Alhaji Lai Mohammed after the Federal Executive Council (FEC) meeting. The meeting between Buhari and Obasanjo was short – not more than two minutes. When Obasanjo entered the expansive hall, he went round to exchange pleasantries with some other African leaders attending the summit, before looking out for Buhari, who he approached. When the Summit opened, President Buhari told his fellow heads of state that the war against corruption had come to stay in Nigeria. Buhari said that Nigeria remained committed to fighting corruption “today, tomorrow and the day after tomorrow”. He said his administration had gone far in its change agenda of which the fight against corruption is an important part. He stressed the need for strong institutions a necessary condition for winning the fight against corruption. To win the war, he said, African leaders must empower anti-corruption agencies and insulate them from political influence. Buhari cited a report that the continent lost $50 billion annually to illicit flow of capital. The manifestation of corruption in Africa, he said, is a demonstration of the need for strong leadership. He called on African nations to build synergy among the executive, judiciary and legislature to entrench good governance. He said that Africans, especially leaders, must have a change of mindset by prioritising accountability and transparency to succeed in the fight against corruption. He, however, noted that fighting corruption is not going to be a straight forward task as corruption will always fight back. Irrespective of any setback faced in the fight against corruption, Buhari said, African leaders must remain resolute. He recommended, among other things, that an African youth congress against corruption be organised and criminal justice system be strengthened to win the anti-graft war. Also at the Summit, the AU and United Nations (UN) signed a Framework Agreement for the Implementation of Agenda 2063 for Sustainable Development. UN Secretary-General António Guterres said after signing the agreement that strong cooperation with the AU was essential for the UN to be able to fulfill its mandate. The UN chief said the new agreements would help bolster the collaboration between the two organisations on a range of global issues. “For the United Nations, the most important partnership is the partnership with the African Union,” Guterres said, alongside Moussa Mahamat, Chairperson of the AU Commission. Guterres said across the three main pillars of the United Nations – development, peace and security, and human rights – the African continent was key to solving global problems. “The international community would not be able to have successes in development if Africa does not succeed in its development taking advantage of its youth ‘dividend’,” he said. He added that neither would the global community secure lasting peace and security if Africa is not able to manage not only its conflicts, but above all, to make strong effort at conflict prevention and resolution. “We will be side by side with the African Union in respecting African leadership in solving African problems to help in this regard,” he said, noting that Africa has also made admirable strides in human rights. “Today, we talk a lot about immigration. I have always seen African countries open their doors to refugees and migration,” the UN chief said, adding that this is a lesson other parts of the world could learn from. The agreement followed the signing at UN Headquarters in April 2017 of a landmark framework to strengthen partnership between the UN and the AU on peace and security, to help the two organisations better respond to the evolving challenges of peace operations. He noted that agriculture and livestock productivity on the continent were under threat and hunger rates continue to increase, and cited the close links among hunger, food insecurity and poverty. He flagged that the majority of undernourished people in Africa lived in conflict-affected countries, where hunger was almost twice as high when the crisis was protracted. He advocated for stronger commitment by governments, the AU and the UN to promote peace, human rights and sustainable development. “To build and sustain peace and address hunger and poverty, we need community-based approaches that build social cohesion and the capacity of local institutions and actors. “Improved governance that can deliver equitable services is essential,” he asserted.